Pomegranate Molasses is definatly one of those "specialty items" but if you happen to have it lying around, here is a great way to make use of it (though its not an essential ingredient). 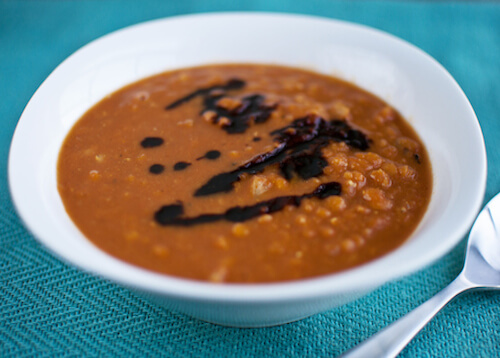 This soup has a Middle Eastern flair about it and the heat can be adjusted from mild to spicy to fit any person's preference. Two great things about this soup (in addition to the taste) it's cheap *and* you probably have all the ingredients on hand in your pantry!! A warm, thick soup that's perfect in Autumn and cleans out your pantry. Line a medium pot with a thin layer of water. Add onions and cook over med-high heat for 2 minutes. Add garlic, then continue to cook until onions are translucent and all of the water has been absorbed. Add broth, lentils and apple and bring to a boil. Once boiling, cover and reduce heat to medium. Continue to cook until lentils are orange and soft, about 7-10 minutes. Stir in pumpkin and spices. Reduce heat to low and cook another 5 minutes, stirring to incorporate all ingredients. Add salt, pepper and cayenne pepper to taste. Drizzle with pomegranate molasses before serving.